I'm an author, playwright, lyric tenor & vocal teacher/manager of LDS children in the arts. I became a LDS in 1967 and it has changed my life. I married in 1969 & we raised 19 children in the Gospel, about which I wrote a book, Treasures In My Attic. We live on the Nubanusett River in Peterborough, NH. The river begins upstate and flows into MacDowell Lake with its level controlled by the dam flood gates. Every so often, a long rain of several days forces the dam controllers to open the gates to control the flow of water so that the valley does not flood. This raises the level of the water flowing past our house so that it becomes a raging, rushing torrent which seethes around and over the giant rocks in the river bed. The sound is deafening. It is almost like living at the base of Niagra Falls. Our house is set high enough on a granite sub-layer so that in the 200 years it has stood, the water has never done damage to the foundation. One such a day caused the raging rapids once again. We and the children use the deeper river pools which form between the rocks as our own swimming whirlpool obtaining great relief from the summer sun. On this day, as in others, the children know to stay away from the river. They know that if they got caught in the rushing water it would carry them directly to the falls a quarter mile away. One year, when my daughter couldn’t go to Girls Camp during this time of deep, raging water, I had to tell her she couldn't swim in the river. She does look forward to playing in the river so she was disappointed. A little later she asked if she could go rock jumping, which she did. The following day, since the rain had stopped, our river was not as seething as before, but the water was still high and the current was strong enough to carry smaller children away. This time I went with her down to the river so she could play in the rushing water. I sat on a large rock outcropping watching her cavort and laugh as the rapidly moving water washed over her. Keri is very sure footed and a good swimmer so I was not concerned as she played in the rapids. The water was cold and refreshing on this early summer day and she frolicked in the streaming water which, she said, felt like a continuous whirlpool against her body. Looking for a place where she could sit down in the water at a point where the current was stronger, Keri walked through the water some six feet away from me. As she stepped into an area where the water was rapidly flowing she slipped and fell into the raging water just outside the pool she was attempting to enter. 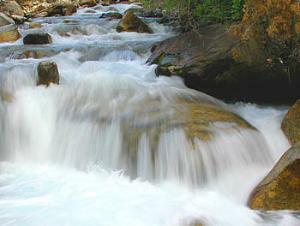 She screamed as the rushing water grabbed at her and began to sweep her down-river. I watched in horror as the rapids carried her toward the falls and said a quick prayer asking the Lord to give her something she could hold on to until I could reach her. He did. Somehow she was able to grab hold of a crevice in a boulder the water had taken her to and hold on. She was screaming and crying and the forceful water was trying to knock her hand loose from the boulder but she held on. I jumped off the rock, calling to her to hang on and not to worry, that I was coming, and entered the churning water as quickly as I could, too slowly, perhaps, for her, because I did not want to loose my balance and be caught by the river's rage and be swept away also. It took about two minutes for me to reach close enough to grab her hand. Just as I was within a hand span of her I slipped and fell to my knees in the churning water. She screamed that she couldn't hold on any longer and, knowing what was going to happen when she let go, she said, very softly, "Goodbye, Daddy. I love you." I watched as her hand slipped off the boulder. "Dear God, no! Please don't take her." I thought as I struggled to my feet. Then the miracle happened. As she tried, once more, to reach out toward me, some unseen force grabbed her body and she remained motionless in the raging stream until I was able to stand firm on the rocky bottom and take her hand. I pulled her to me and held her until she could open her eyes and realize she was all right. She buried her head in my chest and cried. Soon we were able to get back upstream where the current was not as severe and climb on to the shore. We sat there together until her shaking subsided. I thought of the miracle that had saved her life and thanked God for answering my prayer and sparing her life. After some time had elapsed, Keri said that she had to reenter the water. That if she didn't, she'd never go into the water again. We went back in for a few minutes until her fear subsided. Then we went home and shared our experience. I cannot explain how her body remained motionless, frozen in time, until I was able to reach her. All I know is that God caused it to happen. It was another miracle in my life I shall never forget. But Keri knew. Later she relayed her side of the miracle to the family. She said, ". . . I screamed. Suddenly, Daddy went down on his knees. I thought he fell down, but I couldn't look anymore ‘cause my hand slipped off the rock. I knew I was gonna' die when I went over the big falls, and I thought of all the things I hadn't done or said and wished I had more time. As the water carried me down the river, I called out to Daddy and yelled that I loved him. Suddenly, I felt two strong hands grab me by the waist and hold me tight against the flow. I stopped moving. I thought Daddy had rescued me, but when I opened my eyes, he was still a ways from me. I looked around to see who'd grabbed me, but there was no one there. And yet I felt hands holding me by the waist. As I was trying to understand what was happening, Daddy got to me and took me in his arms. The hands that held me tight stopped holding me, and Daddy carried me back to the shore."